The planet Uranus reaches opposition on Saturday (Sept. 29). This means that Uranus is directly opposite the sun in the sky. Uranus rises will rise as the sun sets, and set as the sun rises. It will be highest in the sky at local midnight, roughly 1 a.m. if you are on Daylight Saving Time. Uranus was discovered accidentally by William Herschel on the night of March 13, 1781. All the other planets had been known since prehistoric times, so this was a major discovery in its time, and made Herschel famous. The reason Uranus had remained undiscovered for so long is that, although it is quite large, the third largest planet after Jupiter and Saturn, it is very far away from the sun, so is very dimly lit. If you know exactly where to look, it is just possible to see Uranus with the naked eye, but most of us need binoculars and a good chart to spot it among the thousands of stars of similar brightness. When Herschel first observed it, he was unsure what he had seen: a nebula, a comet, or a planet. After a night or two, he saw that it had moved, so it couldn’t be a nebula. It didn’t change size or shape, so he knew it wasn’t a comet. 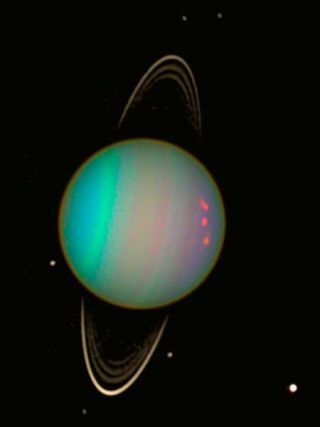 The planet Uranus reaches opposition in Pisces on Saturday, Sept. 29, 2012, and will be visible all night. Opposition night is not the best night to look for it, because the full moon will be nearby flooding the sky with light. Look for it instead tonight, or in a week’s time when the moon has moved on. Don’t try to use Pisces to find it, because this is a dim constellation. Instead, start with the Great Square of Pegasus, a conspicuous large square of stars. This will be in the southern sky (of the Northern Hemisphere) about two thirds of the way from the horizon to directly overhead at local midnight, or in the eastern sky earlier in the evening. Use the two stars on the left side of the Great Square, Alpheratz and Algenib, and project a line joining them down towards the horizon. At almost exactly the same distance below the bottom star you will see (in binoculars) what looks like a double star. These will be the two brightest “stars” in this part of the sky. The star on the left (in the Northern Hemisphere) is 44 Piscium. The “star” on the right is not a star at all, but the planet Uranus. Pay close attention to the distance between these two objects, and check it again in a night or two. Uranus will have moved away to the right, the distance between star and planet increasing. In binoculars, Uranus will look just like a star. In a small telescope with about 200x magnification, you will see a tiny blue-green disk. Uranus has 27 known moons, but these are all too tiny to be seen in a small telescope. One of the most interesting things about Uranus is the tilt of its axis of rotation. Most planets rotate around a pole which points roughly at right angles to the plane of their orbit. Uranus’ pole is tipped over so that its axis is almost in the same plane as its orbit. As a result, the sun shines almost continuously on the northern half the planet for part of its year, and continuously on the southern half for another part of its year. The result is the most extreme seasonal variation found on any planet in the solar system. When Herschel discovered Uranus, he needed to find a name for it. This was as big a deal in the 18th century as naming a stadium is today. Knowing who his chief patron was, he decided to name it after his king, George III: Georgium Sidus (George’s Star). Now George III was not very popular outside England, so there was a lot of resistance to this name. Finally Johann Bode suggested that it be named Uranus after the Greek God of the sky, Ouranos, and this was agreed to by all astronomers. Unfortunately, this name causes pronunciation difficulties for most speakers of the English language. If it’s pronounced "ew-RAY-nus" it provokes laughter from sixth-graders. The alternate pronunciation, "EWR-a-nus" is not much better. Perhaps we should go back to the original Greek pronunciation, "OOR-a-nus." Editor's note: If you snap an amazing telescope view of Uranus, or any other night sky object, and would like to share it for a possible story or image gallery, contact SPACE..com managing editor Tariq Malik at tmalik@space.com.